After 6 years working in the dog industry, I’ve learned that the whole “punishment vs. reinforcement” debate is an extremely hot-button topic. It’s like having a group of conservatives show up at the Gay Pride Parade. Ok, I’m exaggerating, but honestly, dog people are so polarized on this topic that it’s unbelievable how out of hand things can get. Just visit any facebook page where a controversial video or photo is being discussed and you’ll see a bunch of otherwise professionals devolve into mud-slinging school children. I’ve blogged about this before; about how we all just need to learn to get along. That got me nowhere fast. So I’d like to look at this from a purely anecdotal and personal point of view-let’s be honest, is it even possible to be truly objective about this stuff? I don’t claim to be a “clicker trainer”. In fact I know trainers with skills that make me look like a monkey with two left hands. However, I do love the clicker. I love the ability that it gives me to communicate the tiniest pieces of information to my dog without having to constantly repeat “sit…sit…sit…sit…SIT” during a training session. I won’t go into detail about how the clicker works, but suffice it to say that it’s a small mechanical device that works on classical conditioning: Pair the click with a treat often enough and the dog starts to really love hearing that click. It’s a very precise way to let your dog know that he’s done something right. A lot of us trainer-types like to use free shaping. Remember that game you used to play when you were kids? One kid leaves the room and the other kids hide something. The only words they can use to tell him where the item is are “hot” and ‘cold”. The closer he gets to the object, the kids scream “hotter” and the farther he gets, the kids scream “colder” until he finally finds the prize. Think of free shaping as the training version of this exercise. We click the dog for every offered behaviour that’s closer to the one we’re eventually looking for. It’s not easy, but it’s a beautiful thing to watch. This is where my anecdotal evidence AGAINST the use of punishment comes in. Dogs that were previously trained with punishment are MUCH less likely to offer behaviours for me to click. I’m sure there are studies to back up my experience, and if I was feeling smart, I might even look them up for you. However; for today you’ll just have to believe me. The dogs that come to our classes having had no experience with punishment have nothing to fear. 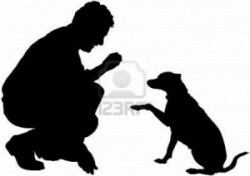 If they offer the wrong paw, turn the wrong way, bark at the wrong dog they won’t be smacked or choked. Therefore, when it comes to being in an actual training session, they’re noticeably more adventurous. They’ll roll on their backs, bark, spin around, paw at the ground and even jump trying to figure out just what it is that will earn that coveted “click”. A dog that has been trained using punishment is the exact opposite. It’s not worth the risk. They don’t feel safe enough to offer new behaviours. It’s like a mine field for them. They never know when they’ll land on something that will earn a shock or a collar-pop. Therefore, they seem very “shut down”, just sitting perfectly still and watching. This is often mistaken for a “well-behaved dog”. It takes a lot of time, patience and perseverance to bring these dogs back out of their shells and convince them that it’s safe to try.